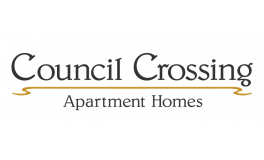 At Council Crossing we believe apartment living is more than just four walls. From the moment you walk through your front door, you’ll feel the comfort and security that makes our residents happy to call us home. Updated apartments, three resort-inspired community pools, and a dedicated staff contributes to a higher standard of living. Convenient shopping, award-winning schools, lakes and parks are all close to hand, with resident activities and events to get to know your new neighbors.